The average working person takes 8,000 to 10,000 steps a day. They deserve boots that fit. Fact: No two pair of feet are the same. Fact: Your left foot and right foot are not the same size or width. the same when you get off work. Fact: No two work boot brands are made the same...from the same shoe lasts. Fact: We all want our work boots to fit PERFECTLY. I know I do. Fact: The average person takes 8,000 to 10,000 steps a day, which adds up to about 1,500 miles over a year. Fact: The human foot contains 26 bones, 33 joints, 107 ligaments and 19 muscles. We offer several suggestions to help you find the perfect fit. If unsure about what to order, this is always the best place to start. The work boot size and width you have worn in the past is always a good indicator of the what you should order at TheUnionBootPro. Using this recomendation, 88% customers get a good fit on the first try. Your feet change during your lifetime. To make sure that you get the best possible fit we suggest you follow the simple sizing directions below to help you select your size and width. The measurements used are industry standards. Stand on the paper wearing a sock of medium thickness. Holding a pencil vertically (90º), place a mark at the end of your heel. To find your size, measure the heel-to-toe mark and use the inch-to-size table. For example, if you are a man and your foot measures 10 1/4" long, you will wear a U.S. size 9 shoe. If your measurements are between two sizes, or you find one foot's measurement larger than the other, always move up to the larger size. A selection of our boots are available in smaller sizes. These smaller "men's" sizes accomodate our female customers. Use the size conversion chart to determine the correct size to order a women's footwear. First, check the labels inside the boots and shoes you already wear - we hope they're American Made. Boots and shoes made in America have a tendency to be more "generous" in size than athletic style boots and shoes we have gotten use to over the last couple decades. If you wear a size 11 Nike® athletic shoe than you probably should try a size 10.5 American Made boot or shoe. Fact: When ordering shoes or boots online we all worry about picking the right size. Fact: Sometimes, we want our boots...now. To make it easier and alot less stressful TheUnionBootPro has created a special ordering option for customers. This could be the closest thing to a perfect fit you could get. Here is how it works: First, find your favorite pair of work boots or shoes. Second, determine your starting size...and the next closest size you believe could fit. View this pop-up link for instructions. We will charge you for one pair, but send you two pairs to try on. There is $20 fee to process the second pair. You have 20 days to return the second pair at no charge other than your return shipping cost. Limited to single orders; second boot ordered must be same style as first boot. Advantages: 1) You get to try on two different sizes. 2) No extra burden on your credit card for ordering two pairs. 3) You have 20 days to return the second pair. 4) You save time and minimize the effort to get the fit and feel you want...the first time! Fact: Not all men and women are created equal. 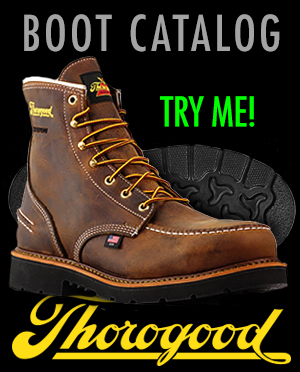 TheUnionBootPro makes it easier to find the boots or shoes that meet your unique footwear needs. We have listed separately, as links, a variety of hard-to-find sizes. In some cases we might be able to custom-make a boot for you. Call our customer service line to order. There is a $60 custom "make-up" fee for each pair ordered. Delivery takes four weeks from date of order. For sizes 15 & 16 there is an addition $5 fee added to the boot price. For sizes 17 & 18 there is an additional $10 fee added to the boot price. What is a "shoe last?" A shoe last is the solid form (wooden or manmade) around which a shoe is molded during construction. There is a unique shoe last for every style and every size made for that style. Which means that for our style #814-4550 there are 47 shoe lasts required. A shoe last represents the design, shape, height, toe shape and volume of a shoe. And, most importantly, the anatomical information of the human foot. All footwear manufacturers use different shoe lasts. Therefore, no two pair of shoes, in the same style and size, will fit and feel exactly the same.